Yelena is a survivor. Kidnapped as a child, held prisoner as a teen, then released to act as a poison taster, she is now a student of magic. But these magic skills place her in imminent danger, and with an execution order on her head, she has no choice but to escape to Sitia, the land of her birth. But nothing in Sitia is familiar. As she struggles to understand where she belongs and how to control her powers, a rogue magician emerges–and Yelena catches his eye. Suddenly she is embroiled in a situation not of her making. And once again her magical abilities will either save her life…or be her downfall. This is the second book to the Poison Study series. Yelena goes back to her family in order to face her past. She is part of the Zalatana clan. The clan members live on trees and have strong magical abilities. Her brother has a magical ability which helps solve criminal cases. Although, she is accepted by her parents right away. Her brother hates her and Yelena does not know why. As the story progressed a lot of people die and Valek returns to her side. I loved the first book but this book fell short. I liked the story but it was not as powerful as the first part. Why I like this story.. I gave this book a 4 hearts rating because the story was predictable. I really loved the first book and I can’t help but make a comparison of both books. The excitement that I felt with the first book was not replicated here. I do like that Valek still tries to help Yelena. Also, that their relationship is very strong. I’m just disappointed with how this second book played out. Also, I don’t know if I will continue with the third book but if I have time to read it, then I will. BUY, BORROW, NEVER MIND: Borrow, because if you are not that curious of Yelena’s past then reading and owning the first book is already okay. Disclaimer: This review is my honest opinion on the story. I did not receive any kind of compensation for reading and reviewing this book. I am under no obligation to write a positive review. 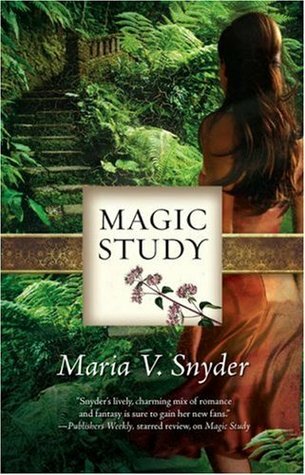 I purchased my own copy of Magic Study by Maria V. Snyder. The book photo and synopsis here is from goodreads.com.